Work on Africa’s cross-continental road network, the Trans-African Highway, has slowed to a crawl, as scores of migrants die attempting the unmade Sahara crossing. Last week, rescue workers in Niger found the bodies of of 92 people – 52 of them children or teenagers – who died of thirst after their vehicles broke down on the difficult Trans-Sahara crossing, part of the long-delayed Trans-African Highway (TAH) project. Around 80,000 migrants cross the Sahara every year on their way to North Africa and Europe. The highway section, part of the Lagos to Algiers road, has been marked for construction for more than a decade but is currently little more than an unmade track. The New Partnership for Africa’s Development (Nepad), which is responsible for finishing the TAH project, claimed on October 23 that construction of the Saharan road section was “almost complete”. But progress on the Sahara Highway and much of the whole TAH project has in fact stalled in recent years, This is Africa has learned. An investigation into the Sahara Highway revealed that the project was said to be 85 percent complete ten years ago, but missing links in Niger still remain. Stephen Karingi, regional integration and infrastructure director of the United Nations Economic Commission for Africa (Uneca), says that a road had been constructed up to the Algerian border but that work in Niger was still “under development”. The stranded migrants are believed to have spent days waiting for rescue on the unmade track near Arlit before leaving the path to search for water on foot. 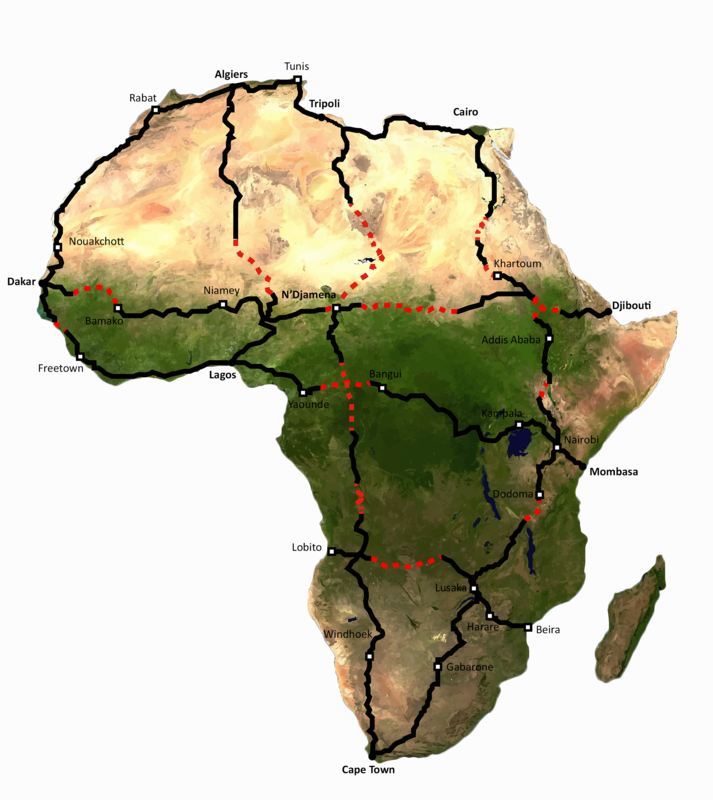 Uneca first proposed construction of a Trans-African Highway after the majority of African states had completed decolonisation in 1971. Nepad was founded in 2001 to work on continental development projects, including finishing the TAH. “For the first time, Africans have conceptualised, developed and presented a continental plan that was to effectively address all its developmental challenges,” says Nepad’s infrastructure specialist, John Tambi, about the organisation’s role. But progress has been very slow. A Uneca official told This is Africa that 21 percent of the TAH is still unconstructed. The project was 75 percent complete in 2003, meaning just 2,000 km of the 54,000 km network has been built in the last decade. The TAH plan incorporates nine primary highway routes totalling 54,000 km of modern road, more than enough to wrap the entire circumference of the earth. One of the central sections, the Cairo to Dakar highway, which runs for 8,640 km across North Africa, was fully completed in 2005 but all eight of the other branches have significant missing links. A new 7,000 km highway, connecting Djibouti to Libreville and Bata in Equatorial Guinea, is set to be announced as part of the network this year. African road networks carry almost $200bn in annual trade, but routes are geared towards port connections rather than linking African countries, inhibiting continental trade. Trade between African countries is estimated at just 10-12 percent of the continent’s total external trade. By contrast, intra-European Union trade represents 64 percent of the external trade turnover of EU member states. Fewer than 40 percent of people living in rural Africa live within 2km of an all-season road, according to the World Bank’s Africa Infrastructure Country Diagnoses. Road density is on average 5 km per 100 square km, less than half the level of Latin America. In Central Africa, 65 percent of the planned highway network is still missing. The IMF noted in October’s regional economic outlook that a key structural constraint on growth was that “cross-border trade within sub-Saharan Africa remains low”. David Wheeler, a lead economist at the World Bank, has suggested that full completion of the network could yield as much as $250bn in economic benefits in sub-Saharan Africa alone, with much of the value going to the rural poor. Safety on Africa’s highways remains a concern. The number of people killed in road crashes, partially as the result of poor safety standards and poor quality of infrastructure, is estimated at 322,000 per year. An African Development Bank report lists financial constraints as the major obstacle to completion. “Most road administrations have a reasonably good idea of how much money would be required to maintain and develop the national road network, but they are not provided with the amounts they consider necessary,” the report says. Political and security factors also weigh heavily on project planners. Some of the national borders that the network was built to transverse, such as the Moroccan/Algerian border, are closed. Police, customs officials, and other militias have also been found to be operating illegal roadblocks along central TAH routes. The roadblocks mean additional, illegal charges are forced on road users. In one assessment project, monitors found that on the route between Abidjan and Ouagadougou, which covers a distance of about 1,000 km, 65 unofficial controls were in place. World Bank programme manager for the Africa transport policy program, Jean-Noel Guillossou, tells This is Africa that merely building better highways is not sufficient for improving regional integration and trade. “Filling the missing links is important but to have safety, to have efficiency and law that will bring trade and save lives you also must have a framework of cooperation and standards so that the people who use roads actually benefit,” he argues. Mr Guillossou says schemes that aimed to harmonise standards on the existing Trans-African Highway had succeeded in the past. In one study transit times were cut by 75 percent through better cooperation between national authorities in Kenya and Uganda. Uneca said it is currently working on an intergovernmental agreement on minimum standards for security and maintenance on the TAH network, due to be presented at the next conference of African Transport Ministers. The conference was originally scheduled for November, but a World Bank official disclosed that it had been postponed until next year. This article was originally published with Financial Times, This is Africa on November 6th.